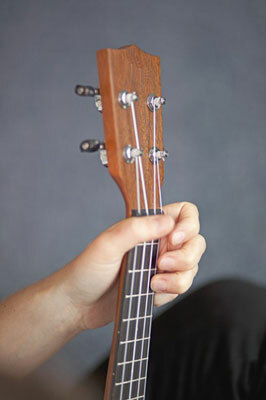 Basic ukulele chords aren’t all as easy as the C chord, which requires pressing on one string with one finger, but they’re all basic to playing a variety of tunes on the ukulele. So start with the commonly used chords here and branch out as your skills and musical taste expands. 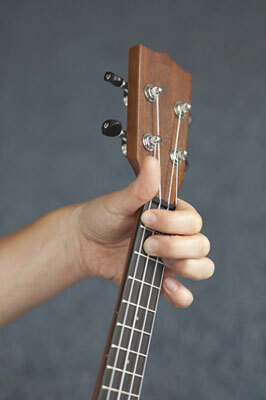 The first chord to tackle is the C chord, which uses a single finger. What could be easier? 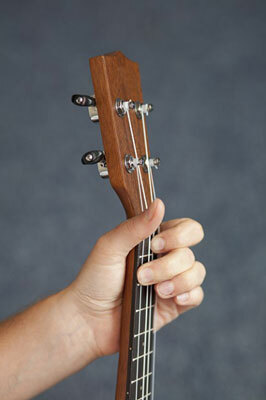 Use your index finger to hold the E-string at the first fret. Use your middle finger to fret the g-string at the second fret. Make sure that your fingers arch high over the strings that you’re not fretting. Strum the ukulele and listen to how it sounds. 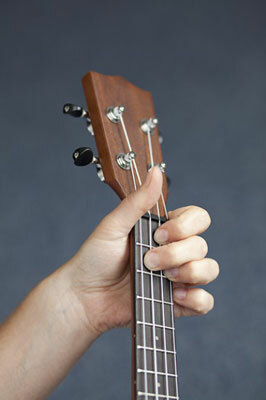 Index finger on the E-string at the first fret. Middle finger on the C-string at the second fret. Ring finger on the A-string at the second fret. Index finger on the g-string on the first fret. Middle finger on the C-string, second fret. Ring finger on the A-string, second fret. 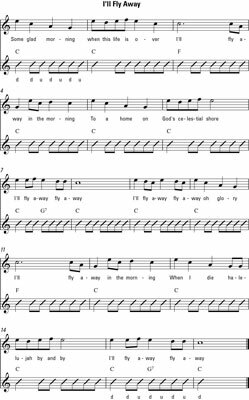 You can combine basic chords to play the song “I’ll Fly Away.” The song sheet shows the notes, which you can sing, the chord names, and the strumming pattern you use for this song, which is down once, and then down-up three times. You can play along by clicking the play button at “I’ll Fly Away”. Make your chord transitions smoother and quicker by anticipating the next chord. For example, when you play a C chord, your index and middle fingers are free. So you can prepare for the F chord by putting them over the place they have to fret next. In this way they don’t have far to move when you change chords.